I’m flying out to visit family, so that means buying gifts and Pinoy stuff they can’t easily get overseas. One of my brother’s bilin is cafe Alamid. Cafe Alamid, also known as kopi luwak in Indonesia is one of the most expensive coffee in the world, also said to be the best. It is in their digestive tract that miracles happen. “The stomach acids and enzymes affect the chemical structure of the beans. I didn’t know where I can buy this strange brew, so I ventured out to Kultura to check if they have it. They don’t have Cafe Alamid, but they do stock Kape de Mutit. 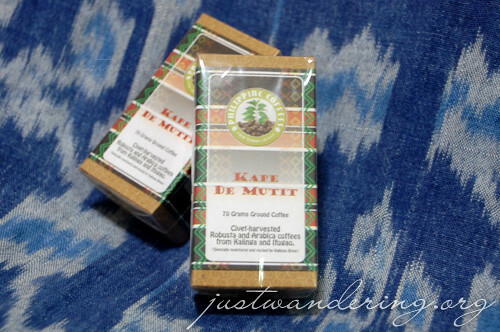 It’s the same civet-harvested coffee, but this one was harvested from the Kalinga and Ifugao provinces. Aside from the word “civet,” I knew this is the same coffee because of the price tag: Php 499.75 for a mere 70 grams, whereas the other coffee are selling for only Php 99.75. The coffee is branded as Philippine Coffees (fair trade coffee), which comes from small farms around the country. The inscription on the side of the box reads, “they benefit micro entrepreneurs engaged in natural coffee farming practices and are paid fairly to ensure their sustainability.” I don’t know where else in Metro Manila you can buy this coffee, but I’ve seen a couple online stores selling them for the astonishing price of $50 for 100 grams. On the gift front, I found these cute shirts for kids and palengkera bag at Bench. 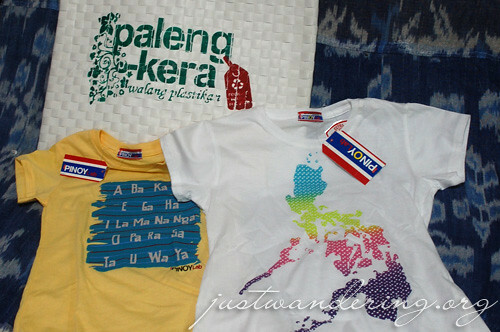 I love how Pinoy-pride themed items are now in vogue. Gone were the days of tacky souvenirs — now you can get these awesomely designed stuff in most local boutiques, not just the Filipiniana stores. The shirts are from Bench’s Pinoy Lab line, which features apparel for kids, tweens and adults. The straw bag was designed by Rey Anthony Villanueva for the Adobo Design Competition. So cute no? The bag was priced at Php 279.00, while the shirts were around Php 300. Great pasaluboy ideas. I love it today it’s in fashion to be proudly Pinoy. Even if retail companies take advantage of this by going overboard producing everything with a map or flag, I swear it shall have a significant positive psychological effect on children &pinoys in general. haha i heart the paleng-kera bag, i wanna get one too! i’m loving ur taste in shopping! idol! I’ve heard a lot about kopi luwak and have wanted to try it for a while, I can’t find it here in NZ but from all accounts it sounds like a good brew. Loving your travel blog, great work. I think Alamid coffee is available in Tiendesitas I saw it there last year, not so sure if it is still available now but coffee shop that sells/serves it is still there. i have got to get my hands on that PALENGKERA bag!!! thanks, i’m glad you like it magnetic_rose! hi, if you live somewhere in the south area, alamid coffee is available at 88 roasters in south supermarket alabang. also, bag of beans branches have it too. That white tee is lovely! I love BENCH! thanks for the pasalubong ideas. for sure they’ll love the fashionalismo tees.